This week’s edition of Raw wasn’t one of the best we’ve ever seen featuring a truly weak ending especially heading into a Pay-Per-View this Sunday, as well as a disappointing pay off to a show long storyline. Luckily there was some great in ring action competition that went some way to rescuing the show. With Payback just six days a way it was time for the obligatory “face to face” confrontation between the two challengers. The “face to face” has become almost a clichéd as the contract signing over last six months with it being used when WWE creative is too lazy to come up with a storyline for the matches, instead opting for this overly contrived stock segment. With an extra element added this time during a glorified advert for a fast food restaurant featuring Vickie Guerrero and Brad Maddox with an interruption from Mr. McMahon. With McMahon claiming the face to face confrontation could jeopardize the Payback main event, Brad Maddox came up with the idea of having the lumberjacks around the ring. With the number of people able to book parts of Raw, as seen tonight with Triple H, Vince McMahon, Vickie Guerrero and Brad Maddox all booking parts of the show, not to mention Booker T and Teddy Long amongst others also being capable, it waters down the significance of each role and makes it difficult for a casual to follow who is actually in charge, WWE should really start wittling down these types of characters, leaving one or two people with the ability to take control. The confrontation itself saw the ring surrounded by superstars, some of whom would be barely recognisable to a Raw audience. With Ryback deciding to stay up on the entrance ramp, the face to face element was lacking from this segment. For someone who’s mic skills are pretty poor in Ryback it was a surprising choice for WWE to have this be the final push for PPV buys, with WWE having Ryback’s actions in the ring as of late speak for him which for me is the best option for The Human Wrecking Ball, and it didn’t really pay off. Ryback still looks uncomfortable with a microphone and would benefit from saying as little as possible on television to build his character or maybe given a manager who can do his talking for him. Cena is of course very competent whilst talking, and managed to keep the majority of his talking serious, instead of the cheesy comedy stuff he likes to do, which definitely helped to keep Ryback feel like a serious contender for the title. The ending of segment was a predictable one, with Cena attempting to get at Ryback only for the lumberjacks to stop him, once Ryback made his way to ring, there was a little back and forth before the lumberjacks invaded the ring to separate the two. WWE has done a decent job of promoting this contest on a whole, with each element of the match being used in the build-up. However, I still don’t think this rivalry is strong enough to support the three stages of hell concept and this disappointing ending to Raw, one of the weakest in recent memory certainly didn’t help it. As promised Triple H vs. Curtis Axel kicked off Raw this week, but it wasn’t long before the match was interrupted by Vince McMahon. With not much of note happening with in the ring, Vince called for the bell, declaring Triple H had lost via disqualification. A power struggle then developed with Triple H restarting the match, only for Vince to declare Triple H had lost by forfeit, causing the Game to announce a 60 Minute Iron Man Match! Axel was then asked to leave the ring by Vince, who took the ring bell and microphone with him. It was a strange start to Raw, but definitely an enjoyable one, and I was certainly interested to see how this storyline played out throughout the show and beyond. There was then a number of backstage segments. Firstly with Stephanie talking to an irate Triple H, trying to convince The Game not to confront her father. The segment wasn’t one of WWE’s finest, with Stephanie screeching throughout, and looking uncharacteristically weak. The Billoon Dollar Princess then went to speak to her Dad in what was a much better segment, with Stephanie managing to hold her own ground, whilst Vince reminded her that business must always come first. It’s been good to see a much more ruthless Vince McMahon back on Raw in the last two weeks, compared to the smiling face we’ve seen over the last year. In a confusing twist, Stephanie attempted to trick both Triple H and Mr. McMahon into a meeting in her office, despite having stopped The Game from confronting Vince earlier in the show. The segment itself however was clever with Stephanie playing off both The Game and The Chairman’s weaknesses to get them into her office at the same. It was once the meeting took place the angle began to go downhill. With Stephanie leaving Mr. McMahon and Triple H alone to work things out, eventually Vince agreeing to give Triple H his match with Curtis Axel only for The Game to say he didn’t want it anymore. This didn’t quite fit, as Triple H seemed to be backing away from a fight, which seemed extremely out of character for The Cerebral Assassin. Now if that part of the segment didn’t quite fit, what was to come was even worse. With the two still arguing, Stephanie returned and attempted to get them to join her in a group hug, which after some reluctance happened. This was a disappointing ending to the show, with no real conclusion or direction heading into the next. It might have worked for Team Hell No, but it didn’t pay off for The McMahons. This was an interesting rematch from last month on Smackdown, with Kane dominating throughout the early going of the contest, looking every bit of The Big Red Monster with a nice uppercut to Ambrose who was leaping of the ring apron. Once we came back from an ad break, Ambrose had taken control and did a good job of working over Kane and keeping him on the floor. Kane’s selling ability probably doesn’t get as much recognition as it should, as he did a fantastic job here, especially when Ambrose was about to stamp on him. However once Kane began to show signs of comeback, the rest of The Shield stormed the ring for the disqualification ending. It was a frustrating ending, but the right one as it left me wanting to see more of the two in the ring together. Backstage, Kane, Daniel Bryan and Randy Orton continued to argue. It’s strange to see Kane as the voice of reason in segment, but it really works between these three. With Vickie Guerrero and Brad Maddox interrupting the argument, to announce that Randy Orton & Daniel Bryan would face The Shield for the Tag Team Championships at Payback. There’s a lot of story going into that match, similar to their contest on Smackdown last week, we know the match will be fantastic, I just hope it has a satisfying ending to continue the story. Kane’s reaction to being excluded from the match was superb, with his voice even breaking during his speech to hilarious consequence. Luckily for Kane and us, Guerrero then granted Kane, re-match against Dean Ambrose at Payback, this time for the United States Championship. Orton and Reigns put on a good short contest, with Reigns looking strengthened his position as a singles competitor by being able to hold his own against Orton for the majority of the match, including a near fall after a jumping clothesline. With Orton launching in his regular comeback, and then looking to hit an RKO, Rollins’ took out Daniel Bryan and attempted to save Reigns, only for Orton to set him up for the Rope Hung DDT, and Reigns having to making the save. The match ended in a no contest, when Daniel Bryan threw himself threw the ropes on both members of the tag team champions. It was decent contest, albeit slightly cookie cutter from Randy Orton again, but certainly couldn’t compete with what was about to come. Daniel Bryan and Seth Rollins put on one of the best Raw singles matches in a very long time. The match was quick and pacy, with the two competitors even managing to make their rest holds look interesting. There was a nice section revolving around the Surfboard submission hold with both men locking it in on the other, with numerous variations and add-ons. This became a theme for the match, with Rollins attempting a number of Bryan’s signature moments, including the flurry of kicks, even going as a far as chanting yes during this moment. With counter after counter and with neither man having much of the offence for too long, both were kept looking strong throughout the contest, with Rollins regularly getting the best of the former World Heavyweight Champion, such as his reversal of Bryan’s back superplex into a cross body for a near fall. The ending came when Roman Reigns looked to be getting involved, only for Randy Orton to prove the equaliser by pulling him off the apron, Bryan then ducked Rollins Stinger Splash and produced a small package for the victory. The Shield as a group may all ready by stars, but this was a star making performance for Seth Rollins are a singles competitor in WWE. Elsewhere, Chris Jericho came to ring to talk about his contest with CM Punk at Payback. After an entertaining promo, Jericho was interrupted by a returning Dolph Ziggler, flanked by AJ Lee and Big E Langston. It’s been around a month since we’ve seen Ziggler live in an arena on WWE television, a long time considering Ziggler is the current World Heavyweight Champion, you’d hope that that means WWE has big plans for The Show Off going forward. Ziggler cut a familiar promo about how he will retain against Alberto Del Rio at Payback, with a number of Ziggler’s regular sayings thrown in. Jericho then challenged Ziggler to match tonight, with Ziggler offering Big E Langston as his replacement. As returns go, this one was slightly underwhelming which was a shame as Ziggler was red hot before his concussion, hopefully he returns to form for the pay-per-view. The Jericho-Langston match was an entertaining contest, with Y2J continuing to prove his worth to WWE with his ability at getting younger competitors over with the audience second to none and Big E continuing to prove that he’s much more than just a body guy. With Langston looking in control, stalking Jericho for the Big Ending, Alberto Del Rio causing the distraction by attacking Ziggler, allowing Jericho to get the win with the Codebreaker. It made sense for Del Rio to get involved in the contest to help build for his match with Ziggler at Payback, but attacking him from behind certainly won’t go anyway to help Del Rio’s still new face persona over with the crowd. I’m sure the two will have a good match at Payback, but with Ziggler having been missing from television for five weeks it really doesn’t have the amount of story needed to drive the contest. In a disappointingly short match, The Miz took on Cody Rhodes. The majority of the contest saw Cody focus on The Miz’ knee, supposedly trying to reduce the effect of Miz’ Figure Four Leg Lock. Which turned out to be The Miz’ only offence in the match, after he reversed Cody’s back suplex attempt and somehow got the hold in. For a short contest it had some nice psychology and managed to build the Figure Four as a devastating hold, although The Miz’ early selling left a lot to be desired. Cody Rhodes is someone he certainly doesn’t deserve to jobbing these kinds of matches and hopefully creative come up with something fresh for him to do soon. With Wade Barrett looking to attack Miz from behind, he was cut off by Paul Heyman who appeared on the entrance ramp. Heyman revealed Fandango could no longer compete in the triple threat at Payback due to a concussion and would be replace by Heyman’s client Curtis Axel. 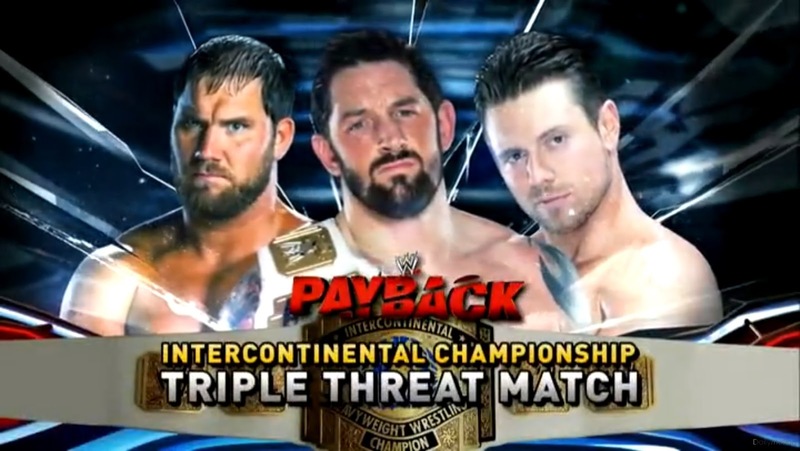 It’s a shame Fandango will no longer be in the Triple Threat as the dynamic between the three men had been built up well over the last few weeks, but I’m glad it wasn’t left as another Miz/Barrett match. Axel will bring a new dynamic to the contest and it will be interesting to see how these three work together. After a long storyline that had gone off the boil towards the end, it was time to reveal Kaitlyn secret admirer. As Big E Langston made his way to the ring with flowers in hand and cut a nice promo on how he wanted to be seen as more than Dolph Ziggler’s heavy, it looked like he and Kaitlyn were about to kiss, only for Langston to push the Diva’s Champion to the mat. When AJ Lee headed down to the ring to berate Kaitlyn further about her plan, was were this segment really got going. AJ cut a very strong promo on Kaitlyn, saying that no one in the audience cared about her, which pushed their match at Payback hard. It’s nice to see the Diva’s getting a mic time and a strong storyline as this will be a major step in getting the Diva’s over with the audience. The talent is there, it just needs to be showcased in the right way. Damien Sandow was also in action, this week against R-Truth. It was a short contest between these two who share some decent chemistry in the ring, their two characters work well together as polar opposites with Sandow picking up the win after his new finishing move The Silencer, a version of Matt Hardy’s Side Effect. If this win was meant to give Sandow momentum going into his Payback Kickoff Match with Sheamus it did very little, as R-Truth has been seen so little on Raw in recent weeks that a victory over him means very little to the audience. Speaking of Sheamus, he came out after Sandow’s win to talk up their match on Sunday, he did a respectable job and I much prefer it when Sheamus takes his opponents seriously as he did here. Antonio Cesaro took on Sin Cara, with Zeb Colter surprisingly joining the commentary team. The match was a fantastic short contest, with both men putting a lot into the match. It was definitely the best match Sin Cara has had in WWE for a very long time, if not ever, as he was allowed to showcase a lot of his offence throughout and managed to do so very well. Cesaro pulled out the win after a crazy looking headlock which he transitioned into the Neutraziler for the victory. The two gelled well together throughout and I would love to see these two face each other again, hopefully in a longer contest and maybe it could be a stepping stone for both men to show WWE what they are truly capable of. It will also be interesting to see what part, if any, Zeb Colter, who spouted about Sin Cara being in the country illegally on commentary, has to do with these two guys in the future. There was also a duet of vignettes, one for the return of Mark Henry. We haven’t seen Mark Henry since his loss to Sheamus at Extreme Rules, so it will be interesting to see where WWE takes Henry from here, as the World’s Strongest Man surely can’t have too much time left before calling it a day on his 17 Year career with WWE. On the other end of the scale, there was another vignette for the debut of The Wyatt Family, in keeping with the creepy style we’ve seen from them over the recent weeks. The buzz for their debut continues to build and I hope we’ll be seeing them on TV sooner rather than later. What have we learned from this weeks edition of WWE Raw? 1. Ryback really shouldn't be allowed to speak. 2. The McMahon's storyline lost a lot of momentum with that group hug. 3. WWE needs to stop plugging it's app and random fast food products every five minutes.